Columbo, Habarana, Kandy, Nuwara Eliya, Udawalawa, & Bentota. Arriving at Columbo International Airport, our guide will be there to meet you and then you will set off for Habarana (About 4 hours drive, with rest stops). Overnight in Habarana which is a small town in the Anuradhapura District and serves as the most central point for interesting cultural site visits. After an early breakfast we leave for Sigiriya to climb the Sigiriya Rock Fortress. A UNESCO World Heritage Site, Sigiriya is one of the most outstanding of architectural wonders in Sri Lanka. Rising nearly 700 feet above one of Asia's most well-preserved ancient landscaped gardens, the rock fortress of Sigiriya is a giant granite monolith. 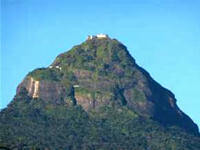 The fortress was built in the shape of a lion, hence the name Lion's Rock. Giant lion paws and intricate surrounding brickwork are all that remain of the forbidding entrance to the Upper Palace. Stretching across nearly 3.5 acres, the Palace on the flat plateau summit was home to King Kasyapa for over 20 years. The floor plan of the Palace is still clearly visible, as is the king's throne and his own personal bathing pool. 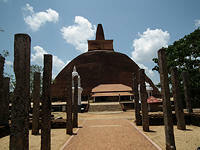 After the visit to Sigiyiya we will go back to the hotel for a quick shower and change before proceeding to Polonnaruwa. 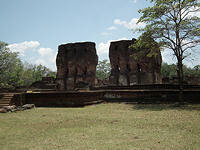 Polonnaruwa is another UNESCO world heritage site and is the medieval capital of Sri Lanka. King Vijayabahu 1 was the first to claim the city as his capital and it was King Parakramabahu who made it what it is today - massive buildings, ornate parks and a 2500 hectare tank called Parakrama Samudra (Sea of Parakrama). The city itself is divided into new and old town with the impressively preserved ruins split into five main areas. Due to its reasonably compact layout, the ruins can be easily explored on foot, and with the surrounding areas flat, well maintained roads, you can leave the car behind and jump on a bicycle to move around. Afterwards return to Habarana for dinner and overnight. Anuradhapura is not only one of the most sacred places but also a fascinating one as this was the first Sinhalese capital of Sri Lanka. The past glories of this city are still evident with the abundance of ancient architecture and ruins dating back to the 3rd Century BC and earlier. To wander around this magnificent ancient city, gives one just a hint of how imposing and majestic this city would have been in its prime. The city’s greatest treasures are its dagabas constructed of small sun-dried bricks and hemispherical in shape. The most notable ofthese dagabas are the Ruvenweli which dates back to the 2nd Century BC and is 300ft in diameter, the Jetawanarama is 370ft and the Thuparama which enshrines the collarbone of the Buddha. The city’s most renewed relic is the sacred Bo Tree which is said to have grown from a branch of the tree under which the Buddha gained enlightenment. It was planted 2250 years ago and is the oldest historic tree in the world. After breakfast, set off for the Dambulla Cave Temple. The Dambulla Cave Temple was first constructed by King Valagambahu and is now a UNESCO world heritage site. During a South Indian invasion, King Valagambahu abandoned his Anuradhapura Kingdom and for 12 years he was in hiding with frequent visits to these caves for his safety. In order to show his gratefulness for his safe place, he converted those caves into Buddhist Temples. he Dambulla Rock Temple is the largest, best-preserved cave temple complex in Sri Lanka with Buddhist mural paintings covering an area of 2100 square meters and with 157 statues. 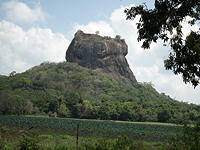 Finishing the visit to Dambulla, transfer to Kandy also visiting a spice garden in Matale. Spices are synonymous with the deep history of Sri Lanka and it not surprising that traders in the past used to trade between the sea-faring merchants using a barter system. Spices also h0ave been a main export of Sri Lanka down through the ages. Cinnamon, ginger, clove, coriander black pepper and cardamom are just some of the spices available in the numerous Spice Gardens between Dambulla and Kandy. We continue with the journey towards Kandy and check-in at hotel. 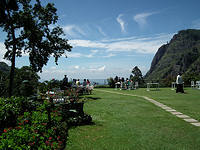 After breakfast proceed to Peradeniya and explore the Royal Botanical Gardens. Once, these beautiful botanical gardens were reserved exclusively for Kandyan Royalty. Today this remains as the largest botanic gardens in Sri Lanka, covering 60 hectares and bounded on three sides by a loop of the Mahaweli Ganga. There is a fine collection of orchids and a stately avenue of royal palms that was planted in 1950. A major attraction is the giant fig tree covering 2500 sq metres. Continue with a tour of Kandy. 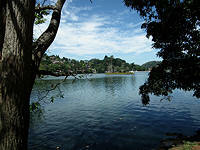 Kandy is one of the most beautiful cities of Sri Lanka, known for its scenic beauty and rich culture. It is UNESCO world heritage listed and has many attractions including the Old Royal Palace, the Temple of Tooth Relic, Kandy Museum and British Garrison Cemetery. Later in the afternoonwe will witness a Cultural Dance Show at one of the Cultural Dance Centres. Overnight at Kandy. Day 6 and Day 7 vary according to whether you will climb Adams Peak: Please specify your choice at booking time so that hotels may be reserved appropriately. After breakfast we transfer to Nuwara Eliya (approx. 4 hours), visiting a tea factory and estate. At Nuwara Eliya we take a short tour of this hill station. Often referred to as 'Little England' Nuwara Eliya has a climate unlike anywhere else in Sri Lanka due to its high elevation. Colonised by the British, the town retains its old-world feel and many of the original Hotels still retain their grandiose colonial style. Thereafter drive to Nallathani and check in at lodge hotel. After dinner and a rest, we take a night climb of Adams Peak You may reach the 2,240 meter high peak - the island's fourth highest - at dawn to witness a glorious sunrise and the mountain's shadow, cast by the rising sun on to the clouds below. Legend has it that, the footprint originally carved in the rock, and, now covered by an oversized reproduction set in cement, was made by the Buddha, on his third visit to the island. The Peak wilderness sanctuary is among the best areas for birds and butterflies in Sri Lanka as well.It usually takes three to four hours to reach the top, but during the pilgrim season, which begins in December and lasts till May, the throng is sometimes so great, it can take over - 30 minutes to move from one step to another. Descent the mountain and return to the hotel for breakfast. Then transfer to Udawalawa (approx 2 hours). Overnight at Udawalawa. After breakfast we transfer to Nuwara Eliya (approx. 4 hours), visiting a tea factory and estate. At Nuwara Eliya we take a short tour of this hill station. Often referred to as 'Little England' Nuwara Eliya has a climate unlike anywhere else in Sri Lanka due to its high elevation. Colonised by the British, the town retains its old-world feel and many of the original Hotels still retain their grandiose colonial style. Check in at hotel. Rest of the day at leisure to enjoy the relaxed pace of life in this hill resort. After breakfast transfer to the railway station for a train journey through stunning scenery (about 2 hours) to Haputale. Pick up and drive onward to Udawalawa and transfer to hotel. Rise early for an early morning safari of the Udawalawe National Park. This National Park is the most popular park for its resident Sri Lankan Elephant population which can be seen in large numbers. It is the only national park where an elephant sighting is guaranteed on every game drive. Udawalwa National Park is also instrumental in the Elephant Transit Home - a project that is geared towards the conservation of the Sri Lankan Elephant. This transit camp is an orphanage of sorts where abandoned, injured or orphaned elephants are treated and then released back into the park. Apart from the elephants there are spotted deer, monitor lizards, sambar deer, wild boar, common langur, jackal, toddy cat and the endemic toque macaque. The Sri Lankan leopard has also been sighted but rarely. 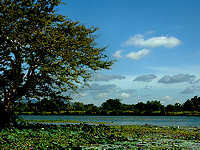 Return to the hotel and relax till late afternoon before proceeding on a second safari of the Udawalawe National Park. 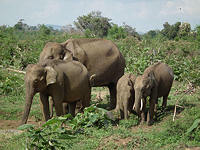 You can include an optional visit to the Elephant Orphanage in Udawalawe in the mid-afternoon if you wish. 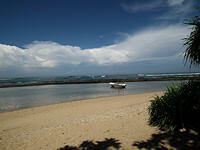 After breakfast we will check-out and head towards Galle. En-route we may have a photography opportunity with the stilt fishermen. If you are adventurous, you can try this ancient fishing method on stilts. On completion transfer to Galle and check-in at hotel. Dinner and overnight at hotel. 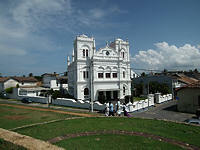 Galle is the best-preserved living colonial Fort in Asia. Today we will take a walking tour to explore the fascinating culture and history of the Galle Fort. There will also be plenty of time to explore the old town at your leisure. At leisure until it is time to transfer to the airport for your departure flight. Cities, both ancient and modern, mountain peaks, wildlife and beaches make this holiday full of variety and interest.